Soon, it will be Monday, and with all the sounds and voices that talk at us and not to us, most of us are not too overjoyed about going back to work. It wasn't that way for Thomas Edison and his wife. Most people know the great inventor was quite deaf. They don't know that when he was courting his wife, he taught her Morse code. In fact, Edison proposed to her by tapping out the request into her hand. She accepted in the same way. 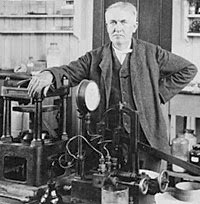 Throughout their marriage they frequently spoke to each other in code and, when they went out, Mrs. Edison would keep her husband abreast of the conversation by telegraphing the words to her husband. Although we certainly appreciate the ability to hear, many of us still long for someone with whom we can be alone and share the thoughts of our souls. It's sad so many people don't realize they have a God who is always inclined to listen to their deepest thoughts, their innermost feelings. We don't need to learn any special language or code to talk to Him. We don't have to worry about Him spilling our secrets. We don't even have to say the words out loud. All we need do is speak to Him and believe He will, because of His Son, our Intercessor, listen to us. Truly, we will never discover a human being who will be as attentive as our listening God. Throughout this week, I encourage you to talk to Him. Tap out the message of your heart and mind and believe, with gladness, knowing that He will, in Jesus, hear us. Dear Lord, Thank You for not only listening to us, but for answering our prayers. Thanks You for Your grace that You pour upon us. In Jesus' Name. Amen.